It's the end of the month, which means it's Secret Recipe Club time. This month I was assigned Without Adornment written by Bean. Bean's blog is gluten free and she has many recipes that are egg, dairy and refined sugar free. I love to bake but am not familiar with gluten free baking. I decided to choose a cookie recipe from Bean's blog and adapt it to include gluten. Gluten free baking requires a lot of ingredients which I don't have on hand such as rice flour, sorghum flour and millet flour to name a few. When I saw Bean's recipe for Ginger Crinkle Cookies, I knew this was the recipe I wanted to make. Ginger Cookies have always been a favourite of mine. I made these cookies in a bowl with a hand mixer but next time I would use a mixer because the dough was flying around and my hand mixer is much harder to control when the dough is thick. I love how the cracks in the cookie develop as they baked. These cookies have a lot of spice so I wasn't sure how the kids would react. I took them with me when I picked them up from school for a snack and they loved them! The clove flavour was quite strong. I had only baked half the batch since I was in a rush and kept the other half in the fridge. A couple days later, I baked the batch that was in the fridge and the flavour of the cookie had changed. The ginger flavour became more pronounced and the clove flavour wasn't as overpowering. I preferred the flavour of the cookie after it sat in the fridge. The taste was closer to the ginger cookies you buy at the store. My boys loved them either way. If you follow a gluten free diet, I encourage you to visit Bean's blog. She has a lot of recipes for gluten free baked goods! In a medium bowl, whisk together flour, baking soda, ginger, cinnamon, ground cloves and salt. In the bowl of an electric mixer fitted with the paddle attachment, add the brown sugar, oil, butter, molasses and egg. Gradually add the flour mixture and beat until just combined. Divide the dough into 2 balls and cover in plastic wrap. Place in refrigerator for 1 hour. I recommend leaving the dough in the fridge overnight. The ginger flavour becomes more dominant and the clove flavour is less strong. Preheat oven to 375°F. Line two baking sheet with parchment paper. Rolls 1 1/2 inch balls of the cookie dough and roll in granulated sugar. Place on prepared baking sheet, 2 inches apart. Bake 10-12 minutes. Transfer on a wire rack to cool. These cookies are so pretty!! 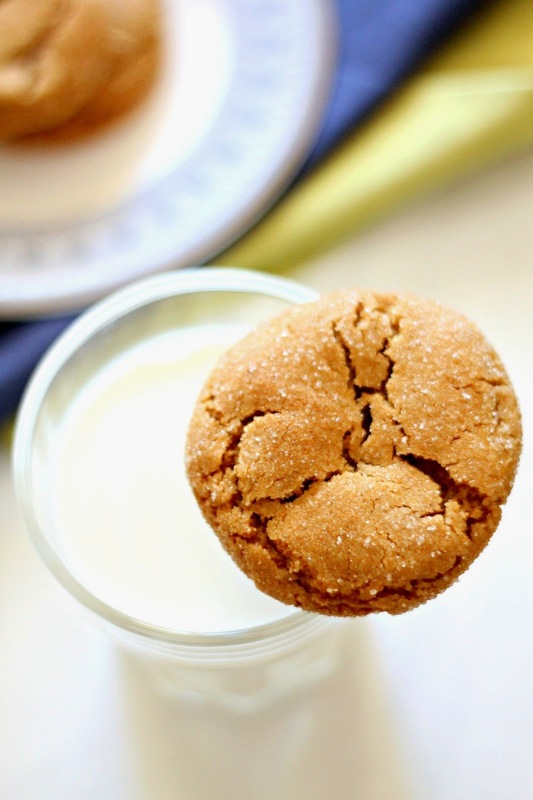 I love ginger flavored cookies (especially the soft and chewy ones), and these look perfect. Happy reveal day!! I'm glad that you and your kids liked them! Thanks for the feedback on the cloves And how the flavour profile changes with time! These looks very good indeed and I'm impressed they are gluten free too. Thanks for visiting UmmHamza! Actually these cookies are not gluten free. The original recipe was! That is an interesting little tidbit about how the flavors melded after refrigeration. Thanks for sharing. Very interesting... I bet I would prefer them after a while in the fridge, because the flavor of cloves can be overpowering for me. Ginger, I can take in any strength! nice post, hope you are having a wonderful Reveal Day! Beautiful cookies! I don't have much experience with gluten free baking either. Interesting about the taste changing with time. Great pick! Very tasty looking! Love the crackly crust. Ginger cookies are one of my faves - love the crackles too! Good choice this month. I literally just finished noshing on a store-bought ginger cookie when I came to this recipe. Too funny! Now I can make my own! Cool SRC selection! You're right - gluten free baking often does use a lot of ingredients that most of us don't have on hand, so well done on adapting this to suit. The cookies look gorgeous & that's a great tip about letting the dough sit overnight. Ginger cookies are my favorite! These ones sound awesome... great pick!! I love the spicy bite of ginger.. so I can imagine how delicious these crinkle cookies must have been. They look perfect! So gluten free cooking is a whole 'other ballgame. One of my friends once asked if I had a good gluten-free naan recipe, and so I looked some up for her and it was honestly like reading a foreign language lol! I have not made these cookies with white sugar or any substitutions for molasses so I cannot say anything about how they will turn out. You could try to substitute white sugar but use a little less as brown sugar is more sweet. For the molasses, try substituting honey. Again, with these two substitutions the cookie will turn out very different. Let me know how it turns out!